Fishing has dwindled the numbers of the pantropical spotted dolphin, a Pacific Ocean inhabitant, at a worrying rate. Initially the cause was traced to 'bycatch' cases in which animals are unintentionally caught in fishing nets with the targeted species. However, studies done by Katie Cramer of Scripps Institute of Oceanography and researchers from the National Oceanic and Atmospheric Administration showed fishing disrupted the reproductive output of the dolphins. It separated suckling calves from mothers and interfered with conception. Fishing activities were launched in the eastern tropical Pacific in the 1950s for the yellowfin tuna fish that swim with dolphin schools. This led to massive mortalities of the pantropical spotted dolphin. With new fishing techniques put in place, bycatch deaths declined by the 1990s but dolphin numbers did not increase.The study proved this to be due to effects of fishing that went beyond direct bycatch kill. The magnetic field that protects the Earth from the sun's violent solar storms has seen the largest breach yet. Based on discoveries last summer by Themis, a fleet of five small nasa satellites, scientists found a 66,400-km-thick layer of solar particles to have entered the Earth's upper atmosphere. Data from Themis also revealed that twenty times stronger solar breaches happen when the Earth's and sun's magnetic fields are aligned. Scientists have believed the opposite to be true. Solar flares are temporary; they are not a risk to lives on Earth's surface, but they can disrupt satellite and ground communications. The data can help scientists predict the severity of solar storms and their effects on power grids, communication and satellite signals. People with immune deficiency related diseases can now look forward to some relief in the form of an artificial bone marrow that can continuously make red and white blood cells. Created by researchers from University of Michigan, this substance grows on a 3-D scaffold that mimics the tissues supporting bone marrow in the body. Designed to function in a test tube, this artificial marrow can replicate stem cells and the key immune cells that produce antibodies for fighting diseases. This would help people undergoing chemotherapy, as cancer-fighting drugs strongly suppress bone marrow function leaving the body prone to infection. This development could also lead to simpler pharmaceutical drug testing, closer study of immune system defects and a continuous supply of blood for transfusions, the researchers reported. Called the "Lungs of the earth", the tropics are rich repositories of biodiversity. The tropical rainforests are home to 60 per cent of the earth's plant species, leading many to believe that tropical plants are less susceptible to extinction. Contrary to this, a study done on plant species around the world, by Jana Vamosi and Steven Vamosi from the University of Calgary, Canada, pointed out that tropical species have a higher risk of extinction. Their findings suggest that equatorial plant species persist at naturally low population sizes, making them more susceptible, than those in other regions, to any disturbance, including human activities. For the study, human factors like gdp, population density and deforestation were taken into account. The study proved that human activity was not the direct cause behind the increasing risk of extinction. It is estimated that 20 to 45 per cent of tropical species are at risk, the researchers said. The bacterial parasite called Wolbachia has been found to shorten mosquitoes' lives and make them unproductive. This offers a potentially new way to help reduce disease transmission by mosquitoes around the world. Conor McMeniman and colleagues from the Pennsylvania State University, usa, introduced the parasitic species to mosquito populations of Aedes aegypti which transmits the dengue and chikungunya viruses. They found that the parasite reduced the hosts' life span by half. Since the dengue virus requires a couple of weeks to incubate in the mosquito's body before it is infectious, the researchers suggested that cutting the mosquitoes' lives short will effectively slow the transmission of dengue and other similarly deadly viruses. The direction in which a coral is growing can tell us when the next earthquake is due. Scientists from the California Institute of Technology studied coral growth along offshore northern Sumatra and warned that the Indian Ocean might soon see another earthquake along the faultline that caused the 2004 tsunami. As earthquake activity takes place, the sea-bed is pushed up. 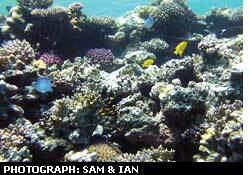 The corals then start growing horizontally thus making evident tectonic movement pattern. The researchers analyzed the cross-sectional details of the corals along a stretch of the 'Sunda megathrust' in northern Sumatra, where an earthquake had occurred in September 2007. The findings revealed the area had witnessed multiple earthquakes over the last 700 years and that the 2007 earthquake might well be a precursor to another one in the coming decades.